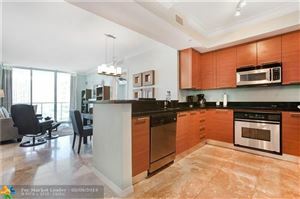 350 Las Olas Place condo is in the center of Downtown Fort Lauderdale and is a commanding residential presence in the Las Olas district. Work, play and relax at this incredible resort style development in the heart of it all. The rooftop of 350 Las Olas Place is one of the main attractions that the building offers. The roof houses the building's pool and health club, as well as events space. Among the features that come standard in 350 Las Olas condominiums are nine foot ceilings, walk in closets, granite countertops, stainless steel appliances and glass doors that open onto spacious balconies overlooking the Fort Lauderdale skyline. The 350 Las Olas Place offers a lifestyle unto itself. Activities abound in the neighborhood – between rooftop sunbathing at the gorgeous infinity pool to sunbathing on the beach, or dining by your doorstep at Las Olas Boulevard or the Riverwalk, you won't be disappointed. 350 Las Olas Place is located within the commercial area of Fort Lauderdale, 10 minutes from Interstate 95 and 15-20 minutes from the Fort Lauderdale International Airport, offering the rest of South Florida and beyond at your fingertips.